In the listed ’Radio House’ of Copenhagen, by renowned Danish Architect Vilhelm Lauritzen, the Danish National Museum has recently re-opened its vast collection of historical musical instruments. 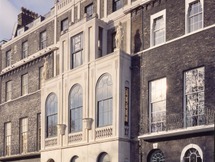 The elegant modernistic building from the 1950’ies have gone through an extensive refurbishment, respectfully carried out to emphasize the unique character of the listed building’s materiality and detailing. 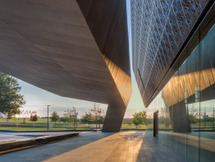 ADEPT is behind concept and realization of the museum design that includes four delicately detailed sound spaces as part of the collection’s educational program. ’The Sonorous Museum’ is comprised of four sound regulated studios, acoustically adapted to a specific instrumental group: strings, brass, percussion and mixed instruments. The four spaces are designed as interactive classrooms in order to provide visiting school classes with a hands-on experience of the classical music instruments and their sound specter. The four spaces are designed as spatial variations on the same aesthetic theme. Each of the spaces are clad in wood veneer, designed to meet and create the optimal acoustic setting for a specific instrumental group. From the vertical lamellae of the percussion space, the seemingly vibrating cassettes for strings to the graphical clarity of the brass space, the four spaces stands out as both contemporary modern and yet very classic in their expression - as a simple and precise continuation of the intended spirit in Vilhelm Lauritzen’s listed master piece. The Radio House, including the National Music Museum and the four sound spaces ’The Sonorous Museum’, is refurbished in great respect of the original building, showing a classic approach that preserves the original design intentions, yet adding contemporary life and modernity to it. The unique architecture of the Radio House has been the main inspiration during the refurbishment process. Everything, from the transparency of the exhibition design to the play of colors, patterns and rhythm in the acoustic walls of ’the Sonorous Museum’, is a modern day interpretation of architectural elements and details from VL’s buildings. The exhibition design is build up around the guest’s physical movement through musical history. The design alternates between glass showcases making the instruments seemingly float in the air and open tableaus showing larger instruments.